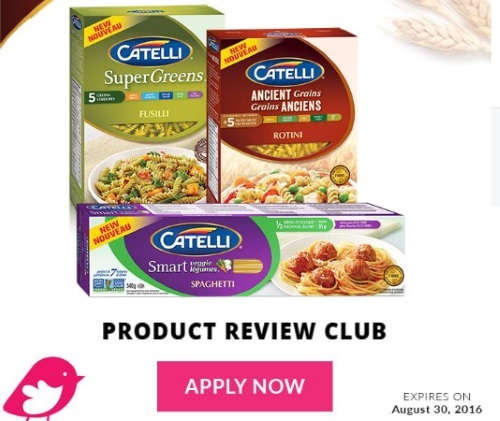 Chickadvisor has a new Product Review Club offer for Catelli pasta! 500 Canadian women will be chosen to enjoy Pasta Night in their own homes together with Catelli pasta. Selected participants will receive either Catelli Smart Veggie and Catelli SuperGreens pasta or Catelli Smart Veggie and Catelli Ancient Grains. You have until August 30, 2016 to apply, and panelists will be notified by email during the week of August 29, 2016. For additional consideration, don't forget to share on Twitter, Instagram, or Facebook and tag your post with #tryCatelli!